Did Game of Thrones Kill This Fan-Favorite Character Off-Screen? Sunday night's Season 6 finale of Game of Thrones was certainly explosive, literally and figuratively, with several characters meeting their makers by the time the credits rolled. As fans still sift through the proverbial rubble of this episode, new details are coming to light, including the possible fate of a character we haven't seen in quite some time. Be warned, if you haven't seen the Game of Thrones season finale The Winds of Winter, there will be Spoilers ahead. The Season 6 finale started with the long-awaited trial of Loras Tyrell (Finn Jones) and Cersei Lannister (Lena Headey), conducted in the Sept of Baelor. Before the finale, King Tommen (Dean-Charles Chapman proclaimed that trials by combat, which Cersei was planning on taking advantage of, would be outlawed, meaning Cersei would have to face her accusers and stand trial, instead of having The Mountain (Hapthor Julius Bjornsson) fight for her in a trial by combat. Cersei decided she wasn't going to stand trial, and instead decided to use the wildfire hidden underneath the Sept to create a massive bomb, destroying The High Sparow (Jonathan Pryce), Queen Margaery (Natalie Dormer) and scores of others in one fell swoop. Making Game of Thrones caught up with actor Dean-Charles Chapman (King Tommen) following the finale, who teased that one long-missing character, the lovable cat Ser Pounce, most likely died in the blast. "He probably got a girlfriend and got married... And probably got caught up in the Sept blast, unfortunately." Ser Pounce first appeared in Season 4 of Game of Thrones, when young Tommen was crowned king after Joffrey (Jack Gleeson) was poisoned. The cat only appeared in one episode, Season 4's Oathbreaker, during a scene where Margaery sneaks into Tommen's room to get to know him better before they are to be married. Tommen reveals in this scene that his brother Joffrey once threatened to skin the cat alive. Dean-Charles Chapman also revealed during this interview that the Ser Pounce scene was actually his favorite during his time on the show, since that scene was actually his first day on the set. "I'd probably choose the Ser Pounce scene in "Oathkeeper." That was my first day, so that meant a lot to me. It's an iconic scene for Tommen with Ser Pounce and Margaery. It was a long, hard day, because the cat was a bit of a diva." 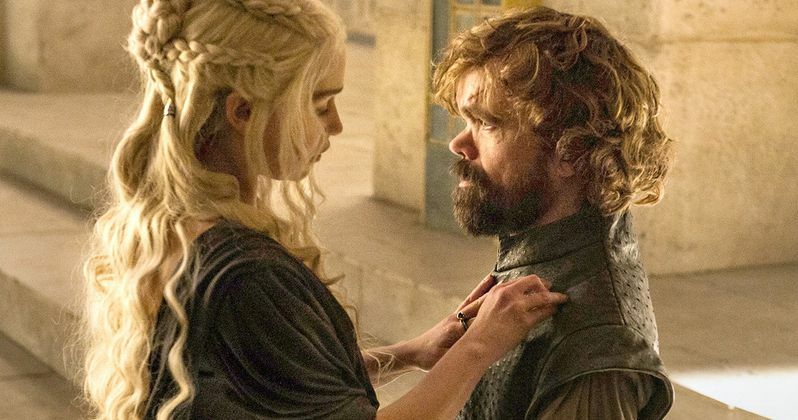 Of course, we're not sure how many would mourn the death of a cat on Game of Thrones, especially given all of the other people who were killed in that explosive scene. There will certainly be more death and destruction in store for fans in Season 7, since Daenerys (Emilia Clarke) is seen in the finale taking her massive fleet across the sea to Westeros. Stay tuned for more on Game of Thrones as we start the long wait to Season 7, which starts production next month.